One of the beautiful things about Creating Together is the varying ages of caregivers. When you come in and scan the room, you’d see grandparents, parents and nannies mingling and supporting each other, while the children play and learn. This intergenerational connection brings out a better quality of life for all ages. For the young, it improves self-esteem, empathy, respect, and a healthier approach to aging. For the wise, it contributes to joy, meaning, improved memory and active living. On a community level, connecting our wisest and our youngest promotes the transmission of cultural traditions and values from older to younger generations, helping to build a sense of personal and societal identity while encouraging tolerance. Apart from offering a space within our community for different ages to come together, Creating Together also spends Circle Time with the senior citizens at White Eagle Residence once per month. In February, this happens this Thursday, February 28th from 10:45-11:15pm. We sing songs together, read stories and chat with the residents. Next month, we’ll be going over on Thursday March 21st (same time) – so do consider joining us! You can either walk there with us from Creating Together, or meet us directly at Chartwell White Eagle Long-Term Residence (138 Dowling) at 10:45am. If you can’t make it to these ones, keep an eye on our calendar for our next visit. 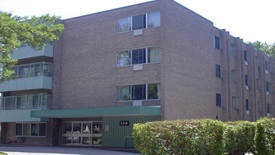 Located in a mature, residential area in Toronto’s west end (right around the corner from Creating Together), Chartwell White Eagle Long Term Care Residence is committed to delivering quality care to its residents. A strong community partner, White Eagle’s highly trained staff has earned a positive reputation for being compassionate and professional in equal parts. Competent in the care and management of residents with mental health concerns, White Eagle is able to accommodate a wide spectrum of care needs, including short-stay residents. With 24-hour nursing care, assistance with daily living activities and high levels of personal care available, family members can feel confident that their loved one is well cared for. Home-like and comfortable, this residence has a warm atmosphere that is welcoming to both residents and their visitors. Be yourself. Youngsters will benefit from and enjoy having someone who listens and gives them their undivided attention. All too often parents don’t have enough time to spend with their children and that’s where you can help. Be a mentor and a friend. Arts and crafts, such as making a scrapbook, create great memories and allow you and a child to learn something new together. Youngsters love to help in the kitchen. The hands-on cooking exercise can be as simple as baking a box cake, with a little measuring and mixing. Gardening is another kid favorite. Spring is fast approaching – so consider digging in the dirt, planting, watering, and sowing together. Sow fast-sprouting bean, pumpkin or sunflower seeds that grow with every visit. Go to the library. Computers and video games may be the new thing, but you can never go wrong with a great story. Teach them about something you love. If you’re excited about it, they will be too. If you don’t have grandchildren of your own, volunteer to share an interest or skill with a local youth organization. The American Red Cross, Intergenerational Innovations and Big Brothers, Big Sisters, just to name a few, can help connect older adults with young people in their community. For more information on intergenerational activities or other issues related to life as an older adult, visit www.4elders.org. The free and confidential resource line offers a wealth of information and assistance to seniors and their caregivers.